It's that time again. 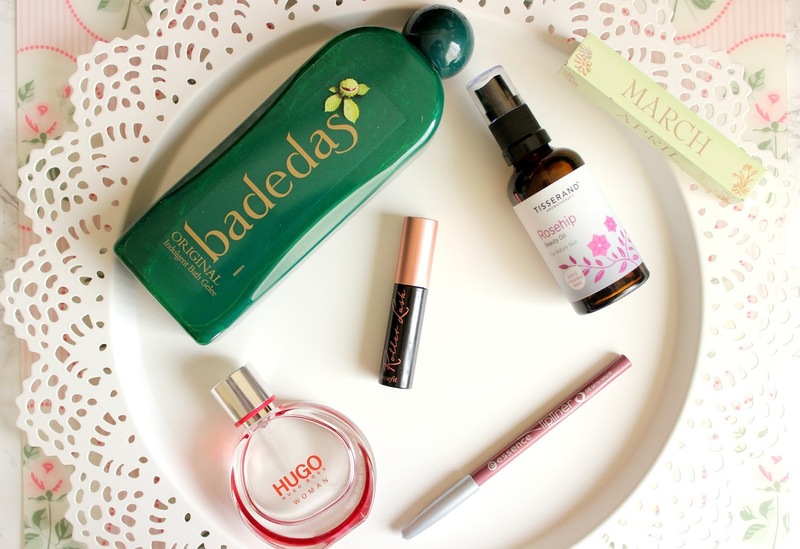 I feel like I haven't done a favourites post for a while, and there's a fair few new products in my stash that I've been loving all month. The first, and possibly my favourite of them all is Badedas Original Bath Gelee. Badedas is renowned for being a new Mum's favourite, but I'm not entirely sure why, as it's not marketed as pregnancy/birth related. It's been said to be great for healing after giving birth, and I know loads of Mums swear by it for this. I love it mainly because of the memories now. When I had George (who's now 2.5yrs), I got a bottle of this and absolutely loved it. It was so gentle and felt like it soothed my stitches (sorry tmi, lol). It's so luxurious and thick. The tiniest bit creates a massive amount of bubbles and the smell is amazing, like nothing else I've ever used. I used up the bottle and I never got any more until recently. Before I had Freddie I treat myself to a big bottle ready for when I came home as I wasn't sure if I was going to need stitches again (turned out I didn't). Anyway, I've been using nothing else in my bath for the past 4 weeks and I really don't want it to end. Sorry Lush, you've taken a back seat for now. 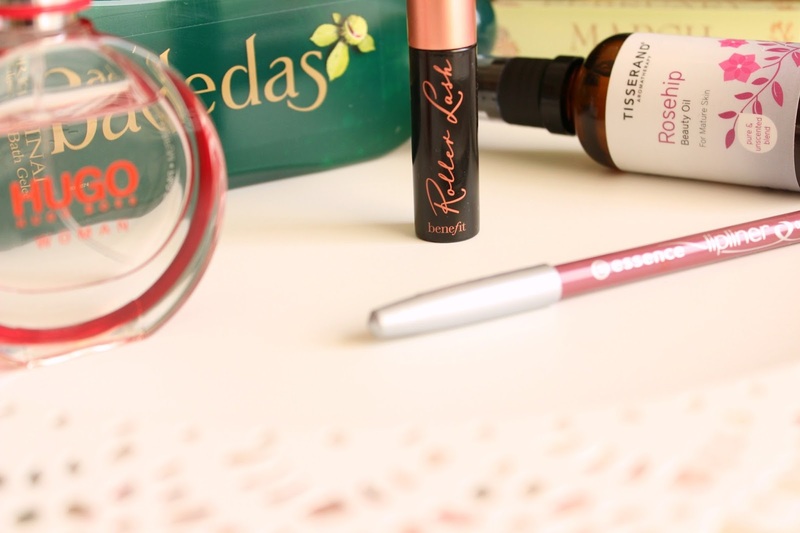 For my skin, I've been loving the Tisserand Aromatherapy Rosehip Beauty Oil (review here). I know it says it's for mature skin, but I swear it's cleared up my hormonal skin freakout and has really helped with the dehydration. My skin looks and feels so much happier since using this daily. I recently spoke about an amazing budget beauty find in the form of essence Lip Liners (post here). At £1 each they're absolutely fantastic and there's some seriously amazing shades. I've been using the shade Satin Mauve on it's own pretty much all month and loving the Kylie Jenner effect it gives. If you haven't tried these already, you need to do so (found in Wilkos). I'm sure you're all sick of seeing this little sample of Benefit's Roller Lash Mascara popping up on every blog, but it's a seriously amazing mascara and I'll be very tempted to splurge on the full size when this runs out. I've been using it since I got it last month and am really impressed. It's the best mascara I've tried in a long time, it gives fantastic lift and curl and separates the lashes to give a fanned out effect. Fab! The whole month I've been wearing pretty much nothing but the new Hugo Woman* by Hugo Boss. It's my perfect perfume. It's fruity and floral which I love, but it's not overly sweet. It has a sophistication about it that you don't normally get with fruity fragrances as it has a slight musky undertone. I know musky doesn't sound great in a woman's perfume, but this really works to create a wonderful warm scent I've been wearing daily. I definitely want to try out those essence lip liners as they are so cheap!!! Hope they are great! I love Benefit's Roller Lash mascara, it is amazing.